‘Nature rejuvenates so quickly, so completely. Though we often view ourselves otherwise, we are nature’, this adage is apt for Arunachal Pradesh as you really feel one with the nature. 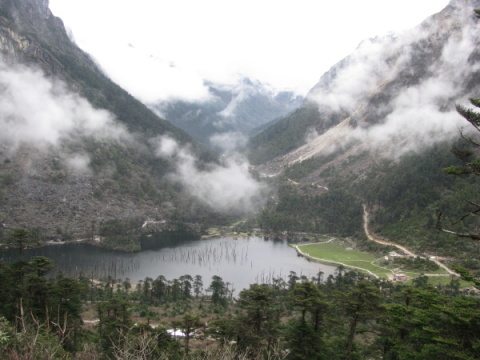 Tawang located at a height above 10000 ft and around 183 kms from Bomdilla is a beautiful hill station of Arunachal Pradesh and is a must-see for all travel enthusiasts. 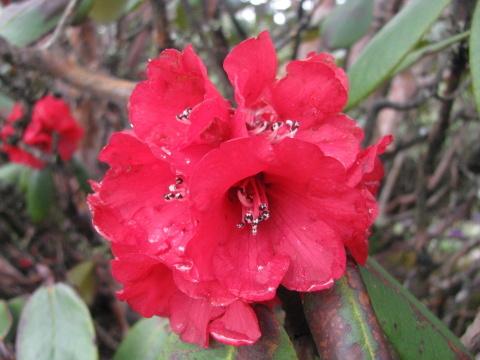 Tawang has a unique historic perspective along with abundant natural beauty. Getting an inner line permit is just not enough to visit Sho-nga Tseir Lake or Madhuri Lake or for the matter Bumla Pass. I had the first one in place as I had done it in advance but the impending uncertainity of getting a permit to visit Madhuri Lake haunted me. 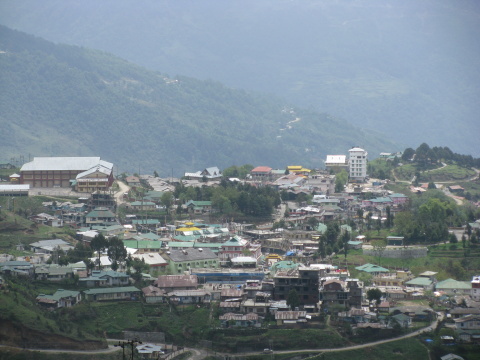 Besides, the day we reached Tawang was a Saturday, a half day and Sunday being a holiday, I was tensed as to how to manage it. Thanks to India Beacons that they had already collected the same on my behalf and my joy knew no bounds when I found their representative handing over the permit to visit Madhuri Lake on Saturday to me. Rest assured of my visit to Madhuri Lake the next day, I went to bed with a peaceful mind but the biting cold, even in the month of May, woke me up at 5 am in the morning. It was good since we had to leave at 8 am for sightseeing. We went down to the restaurant to have breakfast and found Renuka and aunty already over with their breakfast. This extra bit of time permitted Renuka to take a few snaps, and finally, we all set off for M Lake at 8.30 in the morning. 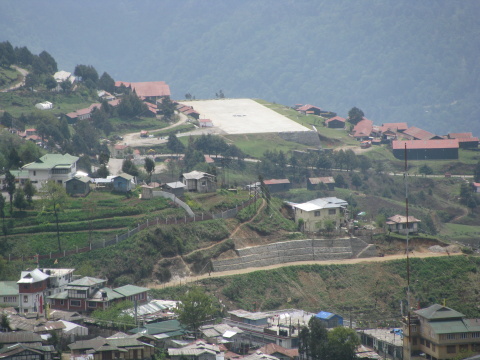 Being close to the Sino-India border, Tawang has a strong military presence. After securing our security clearances, we proceeded towards our destination. 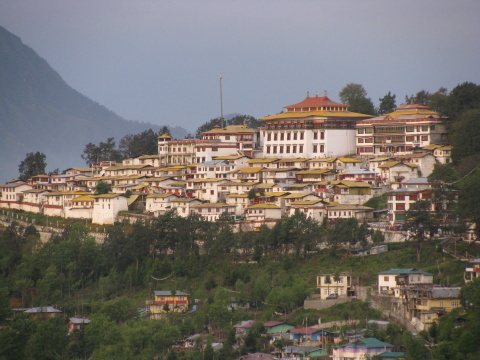 As we gained height, the city of Tawang seemed scattered like a wrecked helicopter all over the hills with the imposing Tawang Monastery catching one’s eye at every nook and corner. 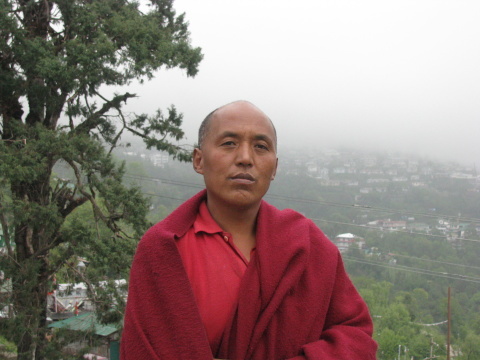 I used the description of scattered helicopter as the air crash leading to the death of the honourable Chief Minister of AP, Mr Khandu, was fresh in everyone’s mind, including me. I imagined how pitiful it must have been for him when the helicopter crashed. 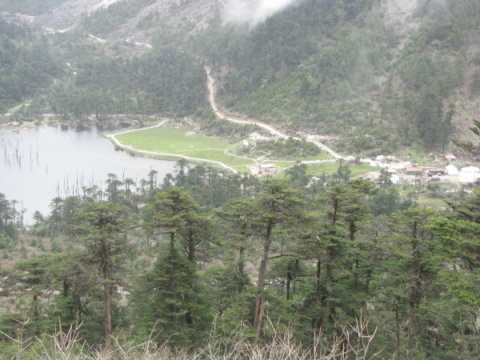 I prayed to god for his soul to rest in peace and proceeded towards Madhuri Lake. We passed through small hamlets and the waving hands of small children greeted us to this beautiful land. 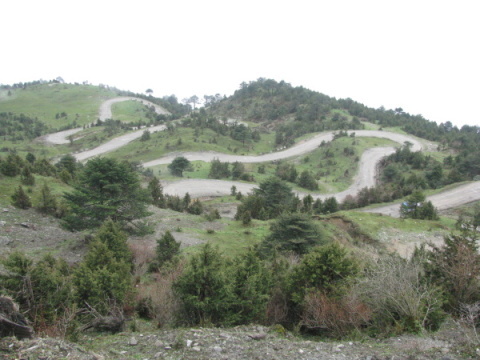 We stopped at numerous places as every bend unfurled a new scenery. Our excitement reached new heights when our vehicle crossed small patches of snow every now and then. 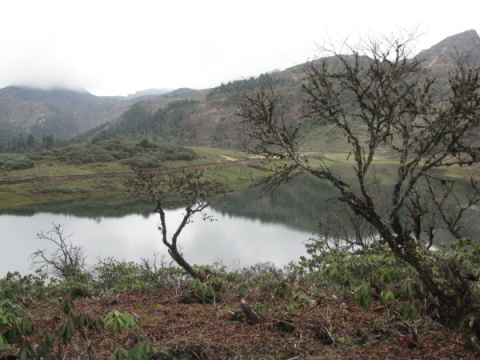 We had not yet crossed the tree level and a beautiful lake on our left caught our attention. This lake was shaped like a heart and is also often referred to as the heart lake. The lake was not too big but it sparkled like an emerald on its rocky banks. Fluttering holy flags on the edges spread positive vibes all around. 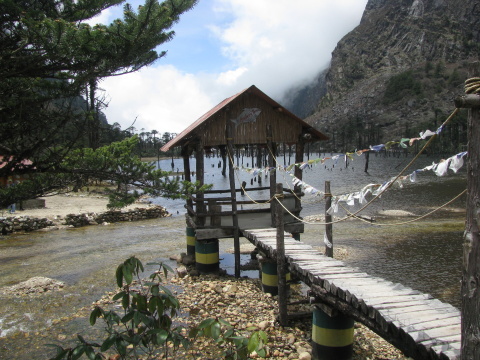 Thereafter, just before the tree line was about to end, a sign board with the message ‘Rest a while and enjoy the prestine beauty of P.T.Tso Lake (Pangateng Tso Lake), a popular picnic spot in Tawang,” greeted us. 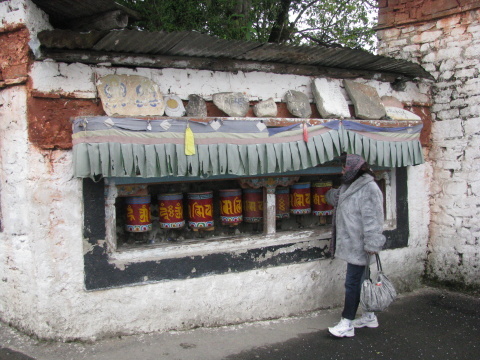 We had reached our first sightseeing halt — PT TSO Lake — Pangateng Tso Lake. The natural beauty and picturesque landscape of PT TSO Lake was simply mesmerising. 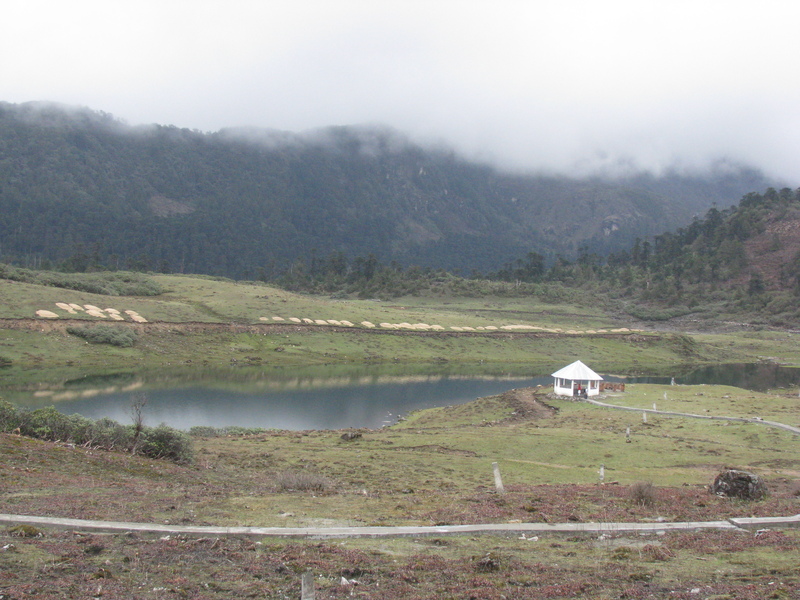 This lake, located at about 14 kms from Tawang, is a must see destination for all visitors to Tawang. One has to walk down some distance to reach the lake. There are small canopies around the lake at vantage points, where people can rest and enjoy the beauty of the lake. The reflection of tall Rhodendron trees all around the lake, the ripples on the water as a result of blowing chilly winds, created a magical effect. 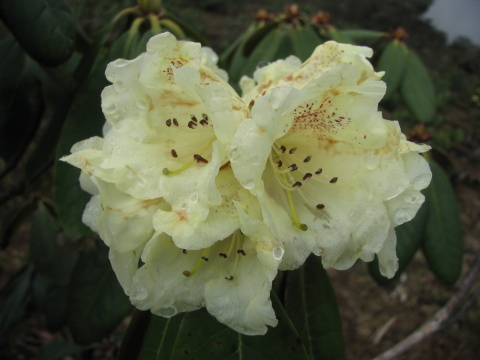 My inquisitiveness and the urge to take photographs of a few variety of Rhodendrom in bloom as well as capturing the lake from unusual angles egged me to walk down to the extreme left end of the lake. 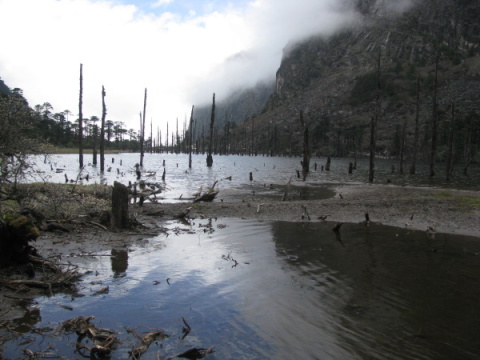 As I walked down, I realised that this lake was being fed from water from unknown sources and I walked upon a sort of swampy land to reach the edge of the lake. It may be noted that some people have experienced breathing problems, but thank god, I enjoyed breathing in fresh and unpolluted air. We halted for around 25 minutes and proceeded to our next halt — SHO-NGA-TSEIR LAKE or Madhuri Lake. The route to this lake was beautiful with snow-peaked mountains and grass laden with ice on both the sides of the road. We asked our driver to stop to enjoy the ice. 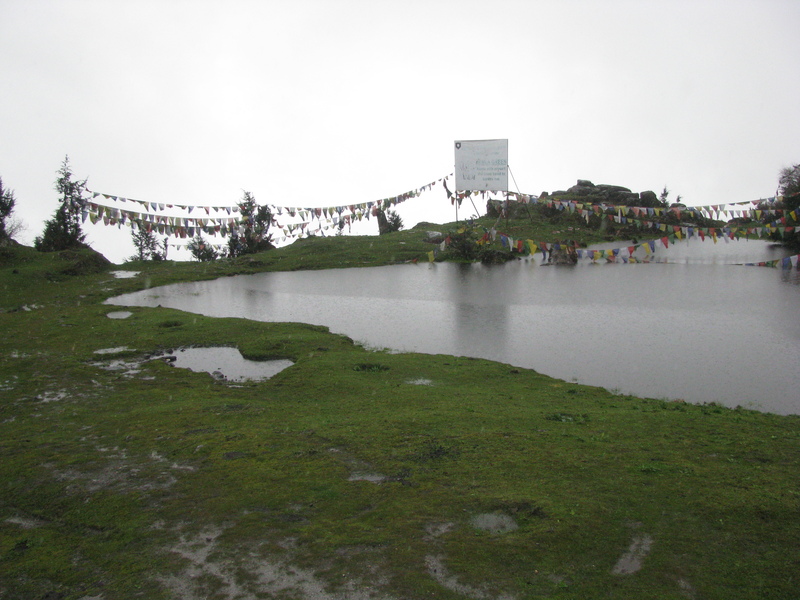 Sho-nga Tseir Lake located at a height of 13500 ft was originally pasturage of Shok-tsen village turned into a lake due to earthquake in 1971. 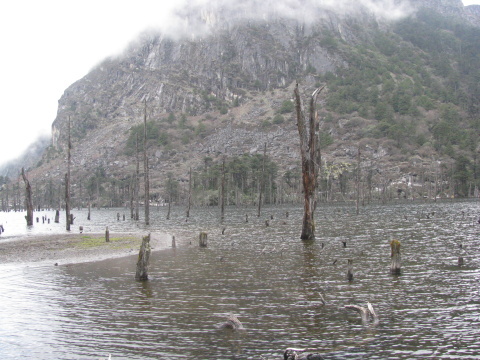 It is also popularly called Madhuri Lake post the shooting of Bollywood blockbuster movie Koyla starring Madhuri Dixit and Sharukh Khan. The beauty of the lake was a sight to behold. 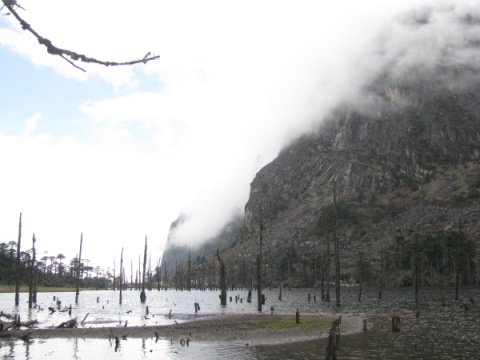 The sheer sight of trunk of trees protruding out of the lake had an unreal feel about it. We took a round of the lake and enjoyed the flowing water of rivulets that merged with the lake. I sat on a tiny bridge with my feet dipped in the cold freezing water, an experience of a lifetime. We relished steaming cup of tea and hot momos in the canteen run by the army for tourists. It was time to leave and with a last glance at this lovely and beautiful lake that left imprints in our soul, we left Madhuri Lake. 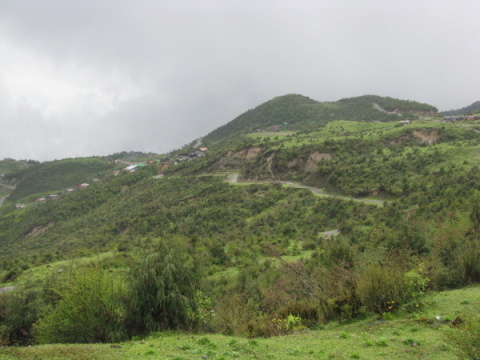 While coming down, we got a very clear weather and we proceeded to our much-talked about destination Tawang Monastery. 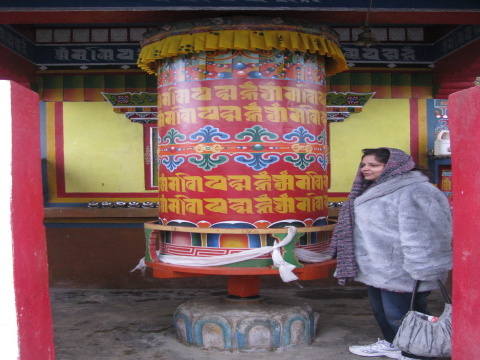 Nestled in the lap of the Himalayas at 3500 metres above the sea level, the legendary 17th century Tawang Monastery, perched atop a hill, surrounded by thick clouds, entices the spiritual part of even the atheists with its ethereal peace. 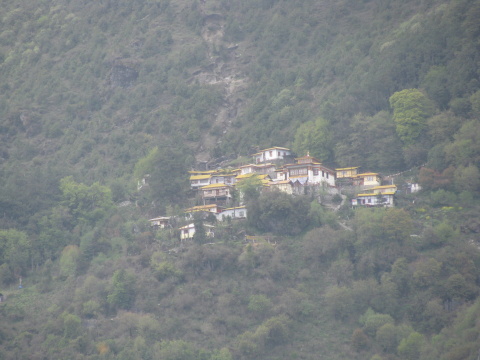 The Monastery is known as “GALDEN NAMGYEL LHATSE” and is one of largest Lamaseries of Mahayana sect in Asia. The sheer size of the Monastery complex leaves you awestruck. Spread over an area of 135 sq. meters and protected by a compound wall of 610 meter long, this Monsatery is one of the finest and rarest. 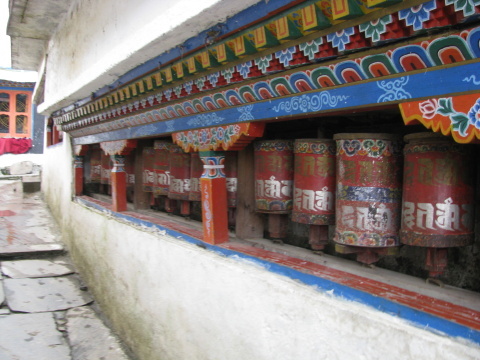 The vastness of the monastery and huge prayer wheels in the compound totally leaves us spellbound. ‘The sound of Buddhist mantra “Om Mani Padme Hum’ reverberated all around creating a pious and pure environment all across. We proceeded to the main hall, where a huge all-encompassing statue of Lord Buddha left us speechless. Colourful paintings adorned the hall and a group of young lamas (small children) offering their prayers was captured in my lens. It took us more than hour to cover the entire Monastery. Finally, we left to visit another Monastery – Ani Gumpa– which is unique since it’s only for women Lamas. 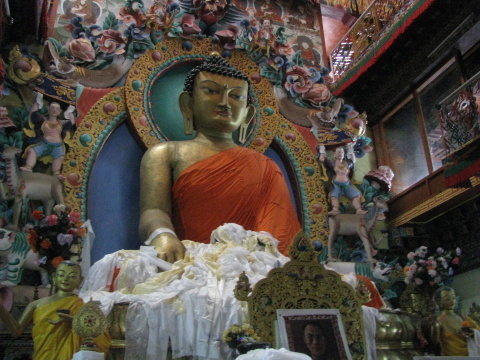 A visit to Tawang is incomplete without the visit to this unique monastery managed and run by nuns. 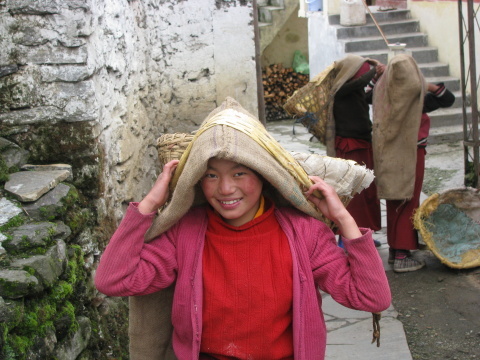 Being a women myself, I was more intrigued and determined to visit this Monastery since I had never visited an only-women’s monastery. 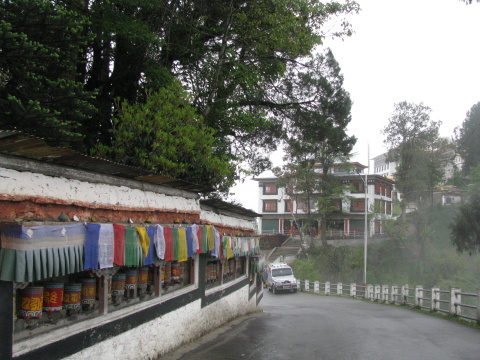 Known as Thukje Chueling Nunnery, this monastery was located at the top of a hill, around 10 kms away from the main Tawang city. 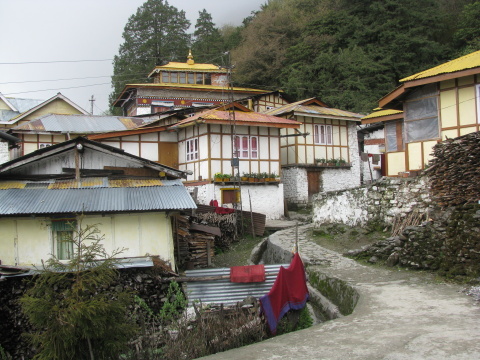 Though miniscule in size, when compared to the magnanimous Tawang Monastery, this small nunnery had its own character and charm.